I joined The Little Red Fish in progress, reading Issue 2 of this developing series with only the vaguest of knowledge that it was written as a political allegory for the Iranian revolution of 1979. Of which I have but a very vague knowledge as well. Rob’s review of this past December expertly delves into the intricacies of Issue 1. But, I’ll get to that in a minute. On its face, The Little Red Fish #2 is the story of a species of beautiful, perfectly scaled, thoughtful fish who wrestle with their place within the life of the sea and sky. In particular, this is the story of Manucher, a special fish amongst them, who can transform into a hawk and navigate between the worlds of sun and surf. Some of the other fish become suspicious of his powers, and the herons who hunt them are skeptical too. 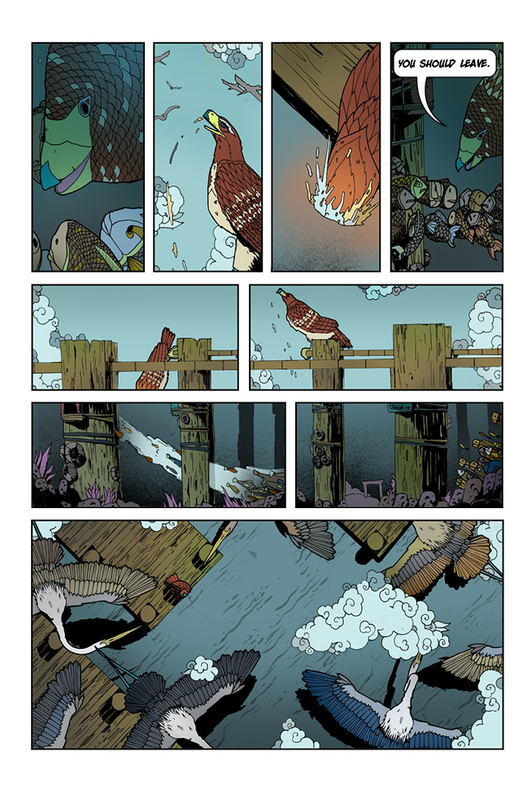 A young fish is killed by the waterfowl, and Manucher is quickly scapegoated for his death, even though he had no involvement. Though the birds are generally the predators of this ecosystem and the fish the prey, the birds reach out to some of the fish in a complex political attempt to take down the good-intentioned shape shifter . This scheme seems good for the fish in the short term, who want to keep Manucher from having an effect on the populace, but in the long term it looks like their undermining of their own societal order will serve the birds and the birds alone. All this time, the titular little red fish trails along near Manucher’s side and begins to understand the gravity of the situation. At the same time as it sets up this dilemma, The Little Red Fish #2 delves into some mystical and marvelous world building -- specifically how Manucher came to possess his powers and wisdom - through the gifts of “the orb” which as he explains to the Little Red Fish, represents the will of the people and “fills our spirit with the will to fight”. It’s heady but beautiful stuff, fanciful and intricate. Bizhan Khodabandeh’s illustration work really shines here. So, here’s how I’m guessing that this story links up with the Iranian Revolution of 1979. At this time, many Iranians were unhappy with the Shah’s dictatorial regime and his ties to the West. Through protest and civil resistance of a variety of groups, Marxists and Islamic fundamentalists alike, and later through violent uprisings, the Shah’s reign was overturned and Ayatollah Khomeini instituted an Islamic theocracy that had it’s own deeply oppressive set of social controls (see Persepolis for more!). It seems that The Little Red Fish burrows into the heart of the action, where alliances were being made and broken between revolutionaries and relations with autocratic and Western influences were being tenuously (and dangerously!) negotiated. To my eye, the fish represent the “People” for better or worse and the birds represent the Shah and the West (at least thus far) -- to wit, one of the herons supports a ridiculous British Royal style crown on his head. However, having attempted to suss that out, I feel that the political allegory in this issue works on a larger scale than just the 1979 revolution -- the people versus those in power, and the complex motives of those who seek for change. An example of Khodabandeh's art from "The Little Red Fish"
Though the story is compelling, I felt that the illustrations were really the star of the show -- the intricately scaled fish, the swirling and sliding through water, the majestic flight and breathtaking wingspans of birds in flight. The illustrations helped the orb backstory feel epic and mythical, which drew me further in. I could look at some of the pages of this issue for hours -- especially those of Manucher, the fish/hawk, taking flight. I recommend taking a look at it if only for the meticulous and moving illustration and color work. Finally, having not read Issue 1, I still felt that Issue 2 stood up on its own. In fact, on my first pass, I thought it was the first issue in the series -- as the story unfolded I was able to infer most of what was going on from the team’s excellent worldbuilding. It did a great job, as a good single issue should, of being a compelling story in its own right, and a tale that leaves you hungry to find out what’s next. When the Little Red Fish saga is complete, I look forward to seeing the collected wisdom and tragedy of the story as a whole, and perhaps getting a clearer sense of the connection of this seemingly allegory to real world events. 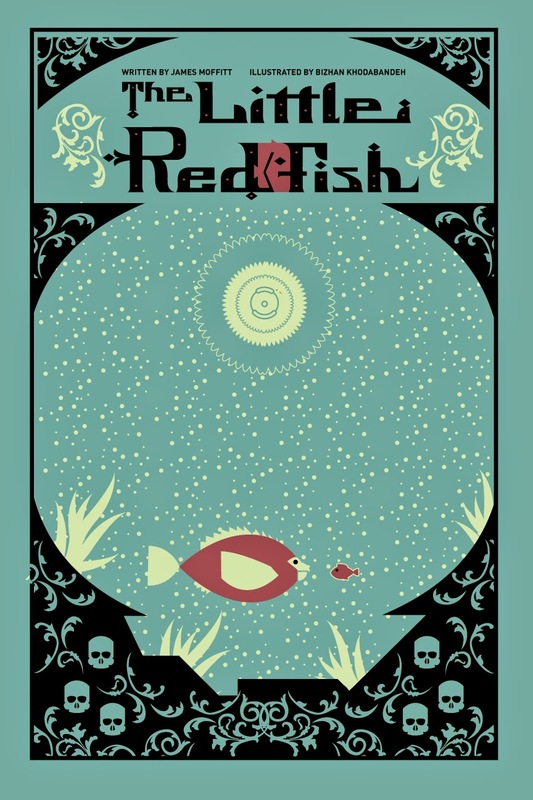 But even if the history is still a bit hazy to me, that’s alright -- Red Fish is a clear-eyed vision of a world in the midst of turning upside down. Bizhan Khodabandeh will be at SPX this year. If you can't navigate your way to SPX, you can find The Little Red Fish here.